A few things have become painstakingly clear since my accident on November 8th, some things have become a little more in-focus. I'm not one to claim that my outlook on life has changed completely, nor that I have somehow become a different, more loving, caring, stop-and-smell-the-flowers sort of person. No, I'm still the food-crazed time-crunched word-mongering lunatic I've always been. But now, there's a little more crazy mixed in. Blame it on the concussion. No, I've become a little more aware of how much my friendships mean to me. I value them a little more now, relish them a little more. I can see them more clearly, I'm aware of how much my friends mean to me. And, without a doubt, how much I mean to my friends. And sometimes we need to be reassured of that. 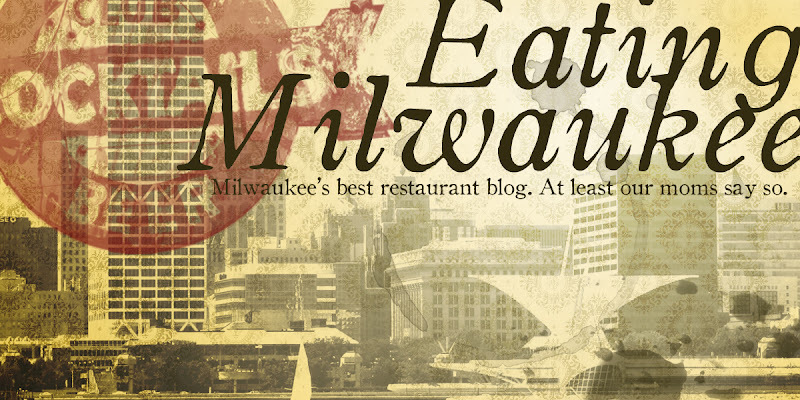 Eating Milwaukee is a labor of love born of friendship: we started this as three friends who loved to eat together. And it should go that once in a while, we have the honor of eating at a friend's restaurant. Such is the case with Mama DeMarinis'. I have the pleasure (and I do mean that) of working with Jessi DeMarinis at the funeral home which keeps the lights on here at the Eating Milwaukee Compound. Jessi married into the DeMarinis clan: her husband Vince is third-generation in the restaurant biz. During the day, Jessi keeps the operations of the funeral home humming along, but at night, almost à la Flashdance, Jessi switches gears to wait tables at the restaurant. It is because of Jessi that I started going to DeMarinis, in a sign of camaraderie to support her on a Friday night. But it is because of Vince's mastery in the kitchen that we keep coming back, to continue sampling his latest creations, or to be lulled into a beautiful food coma by our all-time favorites. Now, you might be wondering what all of the keyword nonsense regarding Scott Walker is about. Well, I'll tell you. You see, I've been to DeMarinis' a million times, but our last visit was Andy and Lauren's first. And, lo and behold, who should be sitting at the waitress' table? Governor Elect Scott Walker. Hmph. Strange, but true, and of course, we have the pictures to prove it! Now, poor Jessi looks as though someone slipped some horse tranquilizer into her Diet Coke, and such continues a long-standing tradition of my taking her picture at exactly the wrong moment. But, the other shot I had has her looking perfect and Scott Walker looking sedated. And, sorry Jessi, but I'm not about to infuriate our state's next governor! DeMarinis' is a prototypical Milwaukee restaurant-bar, built on the first floor of a sizable Milwaukee Bungalow duplex. Inside, you'll find a homey dining room, crowded but workable, and a large bar. 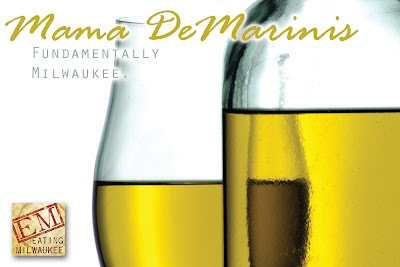 Since July, every business in Wisconsin is smoke-free, and DeMarinis is no exception. As luck would have it, Scott Walker and his party were finishing their meal as we arrived, and we were able to snag his table after he left. The menu at DeMarinis' is comprehensive, but not overwhelming. It covers the basics: pasta and pizza. Don't expect anything exotic, this isn't that kind of Italian. 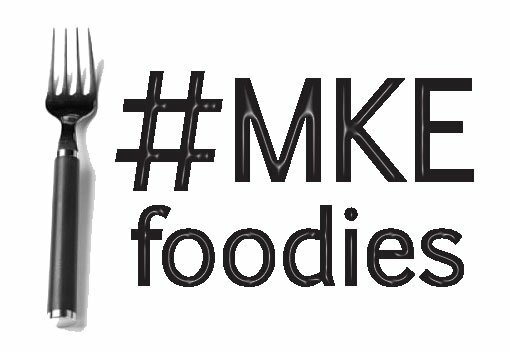 Do expect lots of homemade sauces, crazy delicious (voted City's Best by AOL, btw) seasonal pizzas, a killer Lenten fish fry (or delicious baked fish).. The breadsticks and the 'shroom are both served with Vince's homemade Sugo, while the portabella is also available with his homemade Peppercorn or traditional Ranch. Both dressings are insanely rich and creamy, with the Peppercorn being the favorite at our table: with grated cheese mixed in, and a spicy but well-behaved finish on the tongue. The 'shroom is one of our favorites: simple, and unpretentious. The big mushroom cap is meaty and has a nice tooth to it, never mushy or muddy like some can get. Contrast the meaty chew with the crunchy breading, toss on some bubbly melted mozzarella, and you've got an awesome bar-food meal starter. It should be noted, however, that the night we went as a group, a fryer was down, and as such, we could not indulge in the home-made onion rings that I have probably gained at least 20 pounds from. Vince slices fresh sweet onions on a mandolin -- for every order -- and breads them moments before he sends them to a sweet hereafter in the Frialator. The result is onion strings with tons of flavor, an awesome crunch, and a lot less grease than you'd expect from a steakhouse variety. Served with the homemade peppercorn ranch, they're well worth the inevitable indigestion. I think it's important to note I'm a fan of both DeMarinis' red sauces: the sugo is a little more straightforward and what American tastes would be used to. The Marinara is much, much spicier, with an acidic tang, lots of diced bell pepper and onion, and an abundance of oregano. I love that Vince tosses his pasta with sauce before plating it. I know it's a simple thing, but every single bleedin' strand of spaghetti on my plate had a perfect thin coating of sauce on it. Lauren's mostaccioli was ideally coated in amazingly flavorful garlic-parmesan-parsley butter. It's little things that take a few extra seconds that show that even simple cuisine can still be elegant and exceptionally executed. On other occasions, I've also sampled the Chicken Parmesan, along with Vince's off-menu (but soon to be returning) Alfredo. The chicken parmesan is a fantastically thin chicken breast, pounded, seasoned, and breaded in-house, fried to GBD perfection, and then slathered with either sugo or marinara, topped with mozzarella, and baked until bubbly and melty. It's simple, it's not cutting edge, and it's not avant-garde, but it is fantastically delicious. Vince's alfredo is a wonderful change of pace from bottled alfredos, or chemically-induced alfredo that we've become so used to at the Olive Gardens of the world. Heavy cream, garlic, and grated cheese come together in a ménage à trois of rich dairy insanity. The texture isn't the velvety smooth sauce many are used to: the cheese stays a bit gritty, and the flavor is less buttery and more cheesy, but I adore it. The night I had it, I asked Vince to add in whatever he saw fit, and he put in the kitchen sink; spinach, bell peppers, onions, broccoli, and artichoke hearts, along with a seared chicken breast. DeMarinis' pie follows traditional Milwaukee Party Style rules: sheet pan, medium-thin crust, and square slices. Vince bakes his to a moderate doneness by default, resulting in a crust that is neither cracker-crisp nor soggy, but somewhere in between. The kitchen staff will gladly leave your pie in a little longer if you like it on the crunchy side, like I do. Of course, the red sauce or pesto (whichever you'd like) is homemade, and the blend of cheeses is a big flavor bullseye. This is not from a shrink-sealed package from Klement's. It's not even bulk sausage from a butcher shop. Every ounce of Italian Sausage you eat at DeMarinis' is custom-blended from a generations-old family recipe, unchanged and phenomenal. The same sausage that is plopped in little blobs on the pizza makes up the sausage patty, traditionally found on the appropriately enough named Sausage Patty Sandwich. Salty, spicy, fatty, juicy, and porky... I'm not really sure if there is the need for anything else in life. Maybe a shower once in while. But that's about it. I know I go into this with a bias: the DeMarinis' are good friends, and I want to see them succeed and grow in their business, so I want to hype them up. But our review of the restaurant is a fair one, biased, but true, and you can ask their legions of loyal customers and you'll hear the same gushing praise. Heck, ask the soon-to-be Governor! DeMarinis' isn't flashy, when you walk in, you're not magically whisked away to some villa in the Italian countryside. In fact, at every turn, in every way, you're reminded that you're in Milwaukee: a hard working, blue-collar town made up of a diverse crowd of people... just trying to make it. At the end of the day, especially these days, it's nice to share some table space with some friends, chat it up with Jessi or Kimbo, listen to Vince get excited about locally sourced ingredients, and relax knowing that we're all in this together, whatever this is, and we're all very, very lucky to have it. Oh, sure. It's not stylish. You don't need to wear a jacket, and there's no gimmicky theme. Plastic grapes, red ceiling tiles, and the most diverse crowd gathered in any single place in Milwaukee. It's loud, it's crowded, you will no doubt hear your neighbor's conversation as clearly as your own. But this is a community, and this is dining as a shared experience. This is not an intimate date restaurant, this is loud, boisterous, Friday-night-pizza-with-the-family. And I wouldn't want it any other way. Nothing on DeMarinis' menu is what I would consider expensive. Simple Italian, simply delicious. Don't limit yourself to their pizza! I love the pies, but there's a lot of tastes that languish elsewhere on the menu that you'd be a fool to leave uneaten. Of course, they do a brisk carry-out business, too! Been waiting for this one -- if for no other reason than so that I could see the pictures. Definitely got to give Mama's a try one of these days. Italian food is a terrible downfall of mine -- and just the simple lure of that homemade sausage is pretty strong. Lo, the sausage here is amazing, and trust me, I know my sausage! Wait, why is everyone laughing? I know we don't have a whole lot of pics for this one, but I think they tell the story pretty well. We do, however, have a ton of pics for Mo's, which I will hopefully have some time to finish in the next day or so. Did you have to mention Scott Walker, who cares? I only wanted to read about the restaurant.